I’ve been to China twice, and mostly the people there are wonderful to foreigners. I have some great stories which I may share here over time. That said, there’s a reason why business people in China are historically ranked lower than actors on the social scale. “Honest business” in China is an oxymoron. If you’re on an ABC Tour, you’ll have your whole trip pretty much planned. It will be a draining, “If It’s Tuesday This Must Be Belgium”-type schedule. Try not to exhaust yourselves, or you will get sick by the time you come home, and that will totally spoil the trip for you. ABC will shepherd you during the daytime, and protect you from some scams, but will also take you to tourist ‘traps’ where you can expect to be wooed into buying stuff. The places will be fascinating, and you’ll love them. The hospitality will be outstanding at these stops. Remember that you’re a foreign traveler crossing at least 2 international borders. Make sure you know what you can transport and bring back, what you can’t, and where the value limits are at customs (both U.S and Chinese).For sure, the sellers will feel like sharing this information with you is not their problem. If you buy stuff at the Chinese national stores (which you’ll likely be guided to), you can buy what you love, but don’t necessarily expect to be getting a great bargain. This can be said, though: At the national stores, you’ll get what they tell you you’re getting, because national honor is at stake. Valuations, you’ll have to judge for yourselves. You will have time to yourselves after dinner. Enjoy walking around and sightseeing, but always be aware of your surroundings, as you would in any big city. If you can be part of a small group (4 is a good number), preferably with at least one person who speaks some Chinese, you will have a much better time and also be much safer. Beijing and Shanghai see plenty of Westerners, so you won’t be unusual, but you’ll be conspicuous, and assumed to have money on you. Odd as it may sound, China today is almost like America’s Wild West of the 1890s and early 1900s. Expect vendors to try to cheat you. I was in China with a Chinese-speaking wife and relatives, so I had some great protection from local scams, and we still sometimes got fleeced. There are some things to consider, and some to expect. If you bring a laptop with you, remember that you’re accessing the internet on a Chinese IP. Make sure that your antivirus is really good and up-to-date. Make sure your data is backed up safely at home. China is rife with viruses, worms, etc. Even with great care, I got several when I visited. Beggars are everywhere. After the first several have taken advantage of you or even harassed you (some of them are pretty slick and really know how to play on your sympathies, others can be frighteningly aggressive), you’ll become depressingly hardened to them. By the time you leave, you’ll be treating beggars like a 19th century British colonialist. Be very careful crossing streets. Traffic rules in PR China aren’t treated as laws, but as suggestions. Look both ways when you cross, just like mom said. Cars can be coming from literally any direction on any side of the street, and they don’t necessarily yield to pedestrians. Look into exchanging currency before you leave the U.S. It may be much cheaper than changing currency locally. (Your tour company might offer you some guidance in this area.) Check your local banks for currency exchange rates, particularly the bank you use. They may give you a break as an existing customer. If you have extra Chinese currency when you get home, you might just want to consider yourself a currency investor. The yuan/RMB will likely only increase in value versus the U.S. dollar over the next few years. Whichever cards you choose to bring (and don’t bring all of them), make sure the issuer knows when you’re going and when you’re returning. It’s for your protection and convenience to do so. Carry your cash inconspicuously in a money belt. Dip into your cash privately, and don’t carry too much in wallet or pocket. Be careful with purses. Be wary of using local ATMs. Street vendors are great fun to shop, but never accept the first price. Or the second. They won’t offer you their best price until you literally start to walk away, and it will likely be about 25% of first asking. It all depends on how tough you want to be and how much you want the item. Don’t buy CDs or DVDs. Same for software. They’re almost certainly bootleg, and you will likely have to discard them upon entry to the U.S., and might be heavily fined as well. Don’t trust quality or labels. Silk may be polyester. Diamonds may be zirconias. Old coins may be knock-offs. Be careful of food. If it’s cooked in front of you and they then touch it with their hands, remember that these food stands usually have no running water. Especially if it’s summer, consider bringing plenty of bottled water with you when you go out. (Buying at the tourist attractions will be extremely expensive.) Your tour guides may well provide you with ample bottled water at no charge. Ask. We visited Beijing in July, and it was brutal. 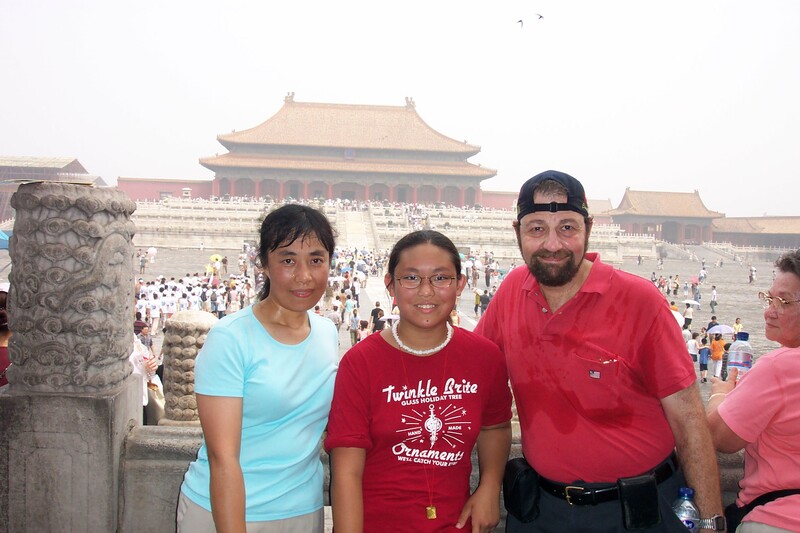 I have photos of us at the Forbidden City, and we look like we stepped out of a pool, fully clothed! Even our tour guide nearly passed out from the heat. China isn’t just another country. In many ways, it’s another world from what Americans are accustomed to, and you will be as naïve as country cousins visiting the big city. It will be fascinating, eye-opening, shocking, memorable, wonderful, and more. This entry was posted in HISTORY, OPINION - POLITICAL, SOCIAL, POLITICS/INTERNATIONAL, SOCIETY and tagged bank, beggars, Beijing, caveat emptor, China, Chinese, credit card, currency, currency exchange, pr china, prc, rmb, secret police, shanghai, tour, traffic rules, yuan by Thinkwing Radio. Bookmark the permalink.